The Lineco 717-2912 Folio Storage Box is a stylish combination of form and function. 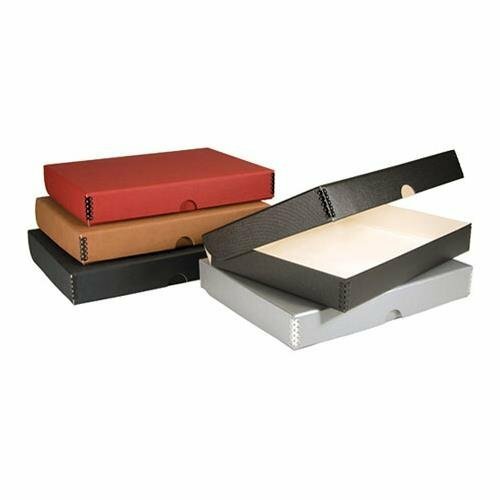 These archival boxes are designed for long-term storage, yet retain an elegant and supple feel and appearance. The clamshell form features a "thumb cut" design that makes for rapid access to the contents. In addition, the edges are constructed of metal for added strength and durability. The archival construction is either faux leather or a metallic covering. The boxboard texture also adds to the longevity factor these boxes offer. For an economical and classic looking storage box, these folios are hard to beat.